Appling imported beeline rectangular guide rail,strong carrying capacity ,steady running ,good durability . Long distance operateable DSP operation system with USB interface ,more simple more humane. We use famous brand water-cooling frequency changeable constant power motor and Sensor–less vector with good performance,big moment of force and high efficency. Using high-speed motor and drivers,double-motors drive Y shaft with a speed to 26000mm/min. Software compatibility ,compatible Type3/ Artcam/ Castmate/ Wentai V8/CAXA/ProeUG other CAM design software. Our product is easier to be worked on with the system of automatic cutter adjustment,which bringing high efficiency in production . Most Advanced DSP NC System and Direct Output from Flash Memory To Save Your Time. Imported Linear Guide Rail Makes More Stable Motion and More Precise Cutting . The frequency changeable water-cooling motor with a high power controlled by Vector, enabling Heavy Moment and Smooth Cutting. 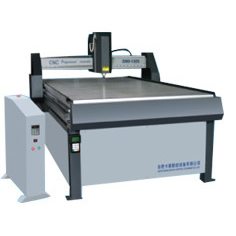 Wood equipment;solid wave board process ,archaic furniture,solid woodern door, art carf wooder ,non- painted door,fold screen, art craft window process and assistance processing of many sorts of table and board furniture. Advertisement industry ;advertisement scutcheon ,sign making ,acryl cuting, blister card moulding and assistance processing of various kinds of decoratin materials. Mould industry. We can care copper ,aluminium and artificial marble ,sand ,plastic board,PVC pipe material,wooden,wooden board and other non metal models.